Fans have now given artists $100 million USD through Bandcamp. Fans give artists $3.5 million every month on the site, and buy more than 16,000 records a day, which works out to about one every five seconds, 24 hours a day, 365 days a year (there goes one now). In terms of units sold, Bandcamp’s share of the record industry is roughly the same as BMW’s share of the auto market back when Steve Jobs said this. Furthermore, sales on Bandcamp are up 30% in the last 12 months, at a time when the rest of the industry is down 11%. We see this growth as proof that if you give fans easy ways to directly support the artists they love, they’ll take you up on it every time. So a big, big thanks to everyone supporting artists on Bandcamp, and to all the artists and labels posting great music too. We wouldn’t be here without you. P.S. 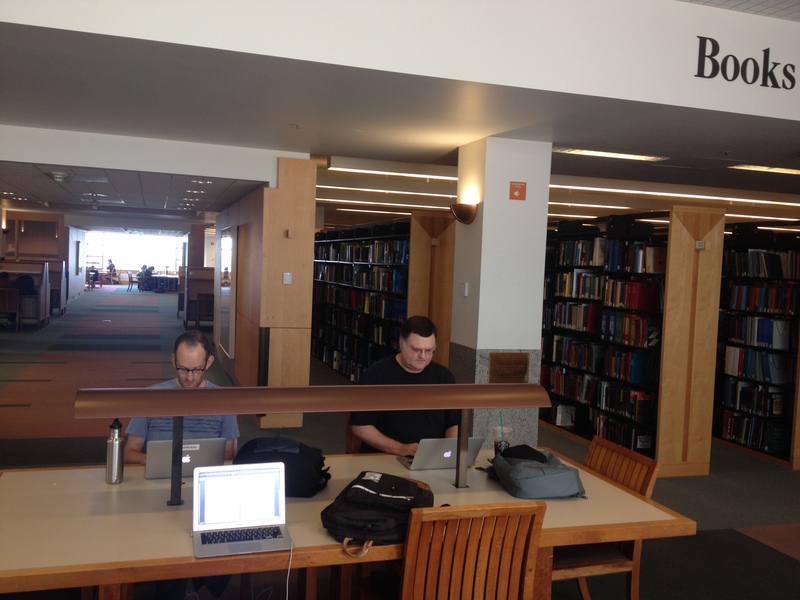 We worked out of the public library for the first four years of Bandcamp’s existence. In May 2009, fans gave artists $12,823.12. It was the first time we’d crossed the $10K-in-a-month mark. I vividly recall sitting across from Kevin and Shawn,* being quietly stoked. *Not pictured: me behind camera, Joe and Neal on irc. This entry was written by Ethan Diamond, posted on March 6, 2015 at 9:28 am, filed under Bandcamp. Bookmark the permalink. Follow any comments here with the RSS feed for this post. Post a comment or leave a trackback: Trackback URL. Kill the music industry, kill it with fire! WOAH! I’m very happy to be a “small” part of this great event! I can’t recommend BC enough. You guys are the future of music. Keep up the GREAT work! I can only be as equally happy as those who know what 100 million can do for a artist. I’m thankful and smile to all who congratulate our success. One million is perfect. Congratulation Bandcamp thanks for encouraging upcoming artist to have their tracks uploaded online. This is Good News…I wish I seen some of the funds myself (Wink Wink) But yeah I love bandcamp and its format and how my music looks on the site. Keep up the good work guys. Bandcamp is the best. Whenever someone complains to me about the state of the music industry and labels as an excuse for not paying for anything, I educate them about Bandcamp. I’ll gladly hand over money to the artists, especially if it funds the creation of more great music. Thanks for having the vision and the b@lls, Bandcamp. I always look for music first on bandcamp, then amazon, cd baby or itunes. I also like bandcamp gives you the options of high and low bitrate mp3, aac and flac. Still waiting for my 100 Mil windfall :) I love the site Bandcamp Peoples! awesome!! saludos desde tijuana,y mochense con un millonsito ahunke sea!!! Found some great music through Bandcamp. I strongly hope ans wish that Bandcamp stays, for a very long time!!! Awesome news, and keep it UP!!!!!! We love you!!!!!!!!! I honestly do not know what I would be doing without Bandcamp. ONE……ONE person has paid for the music. 100 Million….pfft…. Great job. Not only do I love the music, but as a former record business parasite, I love to see the independence these artists have. Cheers! Just wondering if Bandcamp has gone public as a stock option and if so what is it listed as. I do enjoy using bandcamp unlike any other music site. Being able to hear a whole song is so helpful in finding the music I want to buy. You’ve done great things here, congratulations! Congratulations on this milestone! As far as I am concerned Bandcamp is going to be the future and most important alternative to streaming services. I’ve aquired a lot of good music I simply would not have known without your service. Good job! The “music industry” can go eff themselves. Grats! You guys are seriously the best option for buying digital music. Very happy to hear things are going well. I wish more labels would put their stuff up. It’s my preferred way to purchase vinyl, since I can get a lossless download in addition to the record. Keep it up! Its sites like this that put the music marketing back into the artist hands. What a wonderfull place Bandcamp is. how much have you donated back to that library since then? did the library put a “bandcamp was started here” plaque on that spot? Every indie musician on the planet should offer their music on Bandcamp. It’s a far better experience for both artists and fans! Congratulations, Bandcamp. Keep on innovating (but please don’t change things on us too much)!